September SOTM | NJNA is Blogging! I’ve been a bit delinquent in posting lately! Linda, Carol, Sue and I met for our Stitch of the Month stitching last Saturday. Sue and I were lucky enough to see the completed piece at seminar and it is really pretty! So, I sneaked a picture to show to our SOTM group! The rest of you will have to wait for our reveals later in the year! I’m sure these will be even further along by our September meeting! While we were stitching, Sue and I mentioned how cool it was to see the Ort box display at the seminar in Anaheim. So many different threads and combinations! We got to talking about how interesting it was to see ANY piece done in different colors. 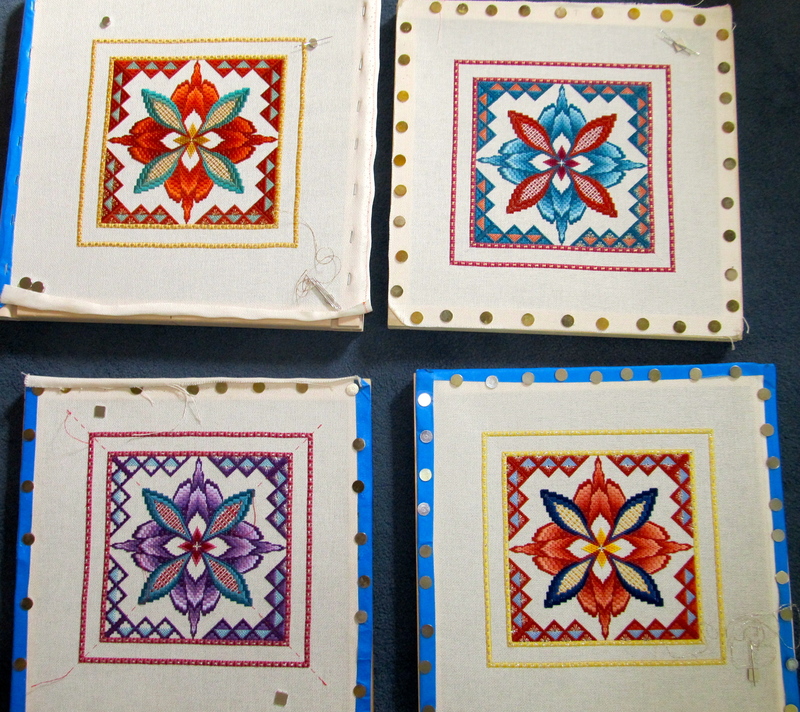 (As an example, remember all the comments we got on our St. Margaret’s Stars at NJ Needlefest?) So we thought it might be cool to do a display in Chicago of all the SOTM pieces done this year — especially since Debbie is retiring as a teacher. Lo and behold, Sue forwarded the idea to ANG and they are going to suggest it to the Chicago organizers! You can see how interesting just four of these are — and Diane’s on black canvas is spectacular! I need to write a separate post about Sue’s and my post-seminar activities in California!